Managing toileting activities is an essential but very personal daily living task. Where possible, everyone would choose to maintain independence, privacy and dignity. There are many elements to consider including access to toilet facilities, transferring on and off the toilet and tending to oneself. If you have a problem, solutions can generally be found by altering your approach to the required tasks, using special equipment, or if a simpler solution cannot be found, altering the home environment. The aim of this factsheet is to provide some basic information and suggestions if you are experiencing toileting difficulties, including identifying some equipment that might help. If you have not had an opportunity to discuss your toileting difficulties with a professional, you are strongly advised to seek an assessment of your situation. Talk to your GP as they can refer you on to a specialist consultant, if necessary. Depending on your needs, they may refer you to your local continence service. A continence adviser is a specialist nurse who can give advice and support on all aspects of the treatment and management of incontinence. General information on managing incontinence is also available from the Bladder and Bowel Foundation. Occupational therapists can advise on equipment to overcome practical difficulties. If you are at home and not currently receiving hospital treatment, you will need to contact the local authority occupational therapy service for adults. You can usually do this by telephone. You may be asked to briefly describe your difficulties over the phone so that social services can direct you to the most appropriate service or professional. If you are struggling with caring for yourself, which includes accessing a toilet and managing your personal hygiene, consider asking for a health and social care needs assessment. Since the Care Act 2014 came into power in April 2015, anyone who appears to need care and support can request an assessment from their local council, irrespective of their income or savings. The Act also places a statutory duty on local authorities and the NHS to support individuals to take steps to prevent their ill health or care requirements from getting worse. These strategies for prevention can include the early provision of equipment and services to help prevent, delay or reduce the development of needs for care and support. The assessment aims to identify any difficulties you may having in caring for yourself and how this impacts upon your well-being. If you have someone who helps you, they can have a carers' assessment to see if they also need support to continue in their caring role. transfer equipment such as sliding boards and hoists. Please note, there can be variation in the range of equipment available and criteria for provision, depending on where you live. You may be provided with equipment and services as a preventative measure, before a needs assessment is done. If, on assessment, your needs are high enough to qualify for help from social services, they will then look at your income and savings to see whether you will need to pay towards any future services you receive. These services might include further disability equipment or adaptations to your home including the provision of remote support via the telephone (telecare), help from a carer, the delivery of meals or residential care. In many areas, a range of the simple aids to daily living may be available on prescription, issued by the assessor. If you receive a prescription for equipment you can take it to a local accredited retailer, which may be a local pharmacy, who will provide you with the item. You can pay extra for an alternative item, so long as it does what the specific item prescribed would do. Your choice may offer extra features, or perhaps you prefer its appearance. Toileting equipment is not readily available on short term loan for hygiene reasons, but local branches of the British Red Cross often run equipment loan schemes and can sometimes loan equipment such as a commode. If you decide to buy equipment privately it is best to try and compare the different ranges first. You may have an equipment demonstration centre near you that you can visit to view different equipment. You will receive impartial advice to help choose appropriately. Contact details for your nearest equipment demonstration centre can be found on the Disabled Living Foundation's web page Equipment Demonstration Centres in the UK. If you are a particularly heavy person, you may find that your choice of equipment is slightly limited. You are strongly advised to check the manufacturer's weight recommendations before trying or buying any equipment. You may also need to consider the width required for you to move or sit comfortably between the arm rests or sides of a frame or commode. Ensure that you do not put excessive pressure or sheer forces onto your skin. When you are looking at equipment, consider practicalities such as space available, keeping the equipment clean and whether it is suitable for a carer to manage, if necessary. If your needs are assessed, a recommendation may be made to adapt your home, to allow you to access and use toilet facilities that are designed to meet your needs and the needs of any carer you may have. If the assessment was made by social services, and is considered necessary and appropriate, they will also assess your financial status to see if you may be offered a Disabled Facilities Grant towards paying for the work. Alternatively, some authorities are able to negotiate a financial loan. You are advised to seek further information from your local authority at the earliest opportunity. They will not offer grant assistance if you have already carried out or started the building work. If you live in local authority housing and they have adapted accommodation currently available, they may offer alternative housing rather than a grant. If you live in housing association or rented property, contact your landlord and seek advice. The document Access to and use of buildings: Approved Document M (Department for Communities and Local Government 2016) gives information on building requirements and regulations to ensure access and use of buildings. Where the toilet facilities in a home are shared, it can be difficult to cater for everyone’s needs. The primary assessment of needs will be for the disabled person, but any carer’s needs must also be considered. Where there is more than one toilet in a home, it is recommended that the most appropriate one is set aside for the use of the disabled individual, allowing others to make use of non-adapted facilities. Local Care and Repair or Staying-put schemes advise older or disabled people who own their own homes on how to modify their homes for their continued independence. Contact your local authority for contact details. The Elderly Accommodation Council also provide information on their website (See Useful organisations). Some bathroom retailers supply bathroom suites or packages comprising a toilet, wash basin and rails which meet the requirements of Approved Document M, often call ‘Doc M packs’. BS 8300:2001 Design of buildings and their approaches to meet the needs of disabled people – Code of Practice gives information on the suggested layouts for accessible toilets in public buildings. Accessible public toilets are designed to the above-mentioned specifications, and might also be fitted with a special lock to give access only to disabled people. Keys are available from local councils, or from the organisation RADAR’s National Key Scheme for a small charge. RADAR also holds a list of the public toilets that belong to this National Key Scheme. Information and advice on design issues is available for businesses and organisations from the Centre for Accessible Environments (See Useful organisations). This organisation also has a range of useful publications about designing environments to remove barriers to disabled people. Give yourself enough time to avoid rushing. Ensure that lighting is adequate, both within the toilet and along the route to it. Avoid having a toilet pedestal mat as it might cause you to trip. Don't use fixtures to hold on to (e.g. a toilet roll holder or wash basin). Fit grab rails instead. Keep everything you need within reach. Don't lock the door if you may need assistance; or use a lock that can be opened from the outside with a coin or screwdriver. An outward opening door provides better access in an emergency, should you fall behind the door. You could consider fitting an alarm to make it easier to summon help in an emergency. It is also essential that any specialist equipment is checked routinely for signs of wear and tear, and that fittings are regularly tightened. Do not leave getting to the toilet to the last minute. Try to anticipate when you might need to go, for example when you wake up or after lunch. Consider having facilities both upstairs and downstairs, so you have easy access throughout the day and night. Make sure your route through to the toilet is kept clear of obstructions. If you use equipment to assist your walking, can it be used easily and safely in the confined space of a toilet? Consider fixing hand rails or grab rails. Check that the height of the toilet is appropriate to your needs. Avoid using the bathroom furniture, e.g. the sink, to help yourself move around the bathroom. Use a raised toilet seat or frame. If you use walking equipment, avoid using the equipment to help you get up or down. Attach grab rails to adjacent walls. If you are sat in a chair for long periods of time, raise your lower legs occasionally to keep your muscles in use. Consider how you can maintain your independence, for example by installing equipment to help with transfers on and off the toilet; by positioning grab rails in strategic places; or by using a sanichair (see below). 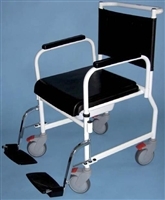 Use a wheelchair with features to help with transfers, for example, removable or flip-up armrests and footrests. Transfers are easier when the height of your toilet is the same as the seat height of your wheelchair. Choose clothing that can be handled/adjusted easily, for example Velcro fastenings. Use a bottom wiper or bidet to clean yourself. Consider using a toilet seat lift (see below). Look at alternative flush controls. Check the height of your toilet and make sure your feet are flat on the floor when seated. 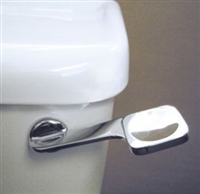 Look at equipment that provides additional support, for example toilet backrests, gated grab rail systems and over-toilet chairs (described below). Consult your GP - urgency can be caused by a medical problem such as a urinary tract infection. Try to anticipate when you may need to go, for example when you wake up or after lunch. Choose clothing that can be handled/adjusted more easily. Seek advice from a continence nurse or a specialist organisation such as the Bladder and Bowel Foundation. Consult your GP - there may be a medical reason such as an infection or the medication you are taking that is causing your frequency. You may have developed a habit of frequently emptying your bladder. Retraining the bladder and tightening your pelvic floor muscles may help. Seek advice from a continence nurse or a specialist organisation such as the Bladder and Bowel Foundation. Information on general equipment that can aid toileting is included here. Rails can be used to push up from, or to pull yourself up with. They are generally fixed to the wall alongside the toilet, but if this is not structurally possible, then a rail that extends from the wall behind the toilet could be used. 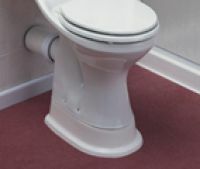 As a general rule, if a rail is required to push up from, it should be positioned mid-way between the back wall and the front of the toilet bowl at approximately waist level, and extend forwards away from the toilet user. If you have weak or stiff wrists, you may prefer to rest the forearm along the rail and push up from this position. If this is the case, a slight deviation of the rail from the horizontal may support the forearm better. If a rail is used to pull up with, it is generally fitted in line with the front of the toilet pan, at approximately waist height and at an angle running forwards and upwards away from you. Sometimes, a horizontal rail followed by a vertical rail (or a right-angled rail) might be preferred to provide two handhold levels. A floor-to-ceiling grab pole may be useful for some people as they allow you to pivot around them whilst still being able to hold on, but they do require significant arm and grip strength to use. It is important to check the distance between the toilet pan and the wall, or any place where the grab rail is sited. If you have to lean sideways or forwards to reach any rail, it will not provide sufficient support and may put you at risk of falling. A drop-down rail fitted to the back wall or a toilet surround frame may be more appropriate. Drop-down toilet rails provide support on a second side, if no wall is present for fixed rails. They also allow the rail to be lifted out of the way when not needed, or if a carer needs to move closer to the individual on the toilet. Toilet surround frames are metal frames that are often height adjustable to suit your requirements. They surround the toilet and provide a hand hold either side to push up from. They can be floor-fixed to provide more stability. Ideally, when seated, your hips, knees and ankles should be at 90 degrees or a right angle, with feet flat on the floor. Standard height toilets are 15-16 inches (38-40cms) high. This may not be high enough for a taller person. installing an adjustable height toilet. These are usually made of fibreglass or clay and can be shaped and coloured to match your existing toilet pedestal. A raised toilet seat usually replaces the existing toilet seat and provides a raise of 5cm, 10cm or 15cm depending on the model. The seat either clamps onto the toilet bowl or is fitted using the standard toilet seat fixings. Less flexion is required in the hips and knees if a higher seat is used, making it easier to sit down and stand up. A seat that is too high, however, can leave you feeling unsupported. Ideally, feet should be flat on the floor to give stability. 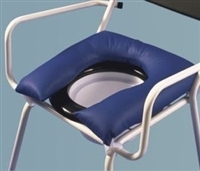 Raised toilet seats are available with arm rests for extra support when seated and when standing from the toilet. These are toilet seats attached to a metal frame that surrounds the toilet. Their height can usually be adjusted to set the seat at the height required for your use. The frames can either be freestanding or fixed to the floor. They have the added advantage that they provide a handhold either side, but they are more obtrusive. These provide a higher sitting position and may assist you if you have difficulty bending at the hips. However, they also present problems for people who use a wheelchair since the difference in transfer height may be too great. These are replacement toilets that are usually mounted on wall fixings that allow the toilet to be adjusted up and down, powered via a low voltage electrical supply or water pressure. If you are unable to stand up even with the use of rails or a raised toilet seat, consider installing a powered self-lift seat. This helps you to stand by rising and tilting forwards, much like a riser armchair. Some have integral hand rails. If you have poor balance then it is essential that you are able to place your feet flat on the floor to give yourself a solid base. The style of seat can also help. A dish-shaped seat is shaped to accommodate the buttocks and tapers down towards the aperture. A contoured seat is shaped to support the buttocks but is also raised slightly at the centre front to help keep the legs apart and to provide better support for the thighs. Padded seats can provide a degree of compression under the heavier areas such as the buttocks, providing support in a similar way to a dish-shaped seat. A standard toilet does not provide any back support. Therefore, if you lean backwards, you will be more inclined to slip forwards on the seat. 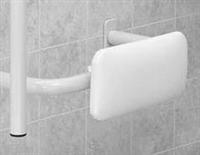 A simple back support pad fitted onto a horizontal rail on the wall behind the toilet, positioned at waist level can help to maintain an upright position. Contoured height adjustable back supports are also available, often with a harness, providing support around the body to maintain an upright position and prevent sliding or falling from the toilet. A full-length backrest fitted with a harness can provide support for you if you have insufficient muscle tone to maintain an upright position independently. Rails either side, provided by a toilet surround frame or by wall-fixed rails will provide handholds to help you to stabilise your body. If rails are required at both sides, a fold down rail fixed to the back wall can be swung clear to provide better access when transferring. Some systems have the addition of front rails (gated rails) that fold down in front of you once you are positioned on the toilet. These chairs are either free standing or mobile and are placed/wheeled over the toilet. They have two advantages: they provide better sitting support and they avoid the need to make awkward transfers within the confined space of a toilet compartment or bathroom. Multi-function chairs, often called sanichairs, can be used over the toilet, in the shower and as a commode. These chairs are mobile and can be attendant or self-propelled. If you are a heavier person ensure that any equipment you use is designed for your weight. Check the manufacturer's information. Front transfer – users positions their wheelchair facing the toilet and slide forwards to straddle the toilet bowl, facing the cistern. Front-pivot transfer – users face the toilet with their feet on the floor. They then pull themselves up and pivot 180 degrees to sit on the toilet in the conventional way. Side transfer – users position their wheelchair alongside the toilet, remove the armrest and slide themselves across. These are smooth-surfaced, solid boards, tapered at either end to assist sideways transfers by bridging the gap between the wheelchair seat and the toilet seat. Some are specifically shaped at one end to allow for the toilet aperture. These comprise two circular discs that rotate one against another. They can be used to place the feet on when doing pivoting transfers. If further assistance and/or support is needed, then it may be necessary to use a mobile over-toilet chair or an overhead hoist. Self-propelled over-toilet chairs enable the wheelchair user to transfer themselves into the chair from, for example, the bed, propel themselves into the bathroom/toilet and manoeuvre themselves over the toilet. Features such as removable or fold-up arm rests, retractable or flip-up footrests can make transferring on and off the chair easier. Multi-function chairs/sanichairs can also be used, and have the advantage that they can be used as a commode and shower chair, making for a less cluttered environment. These hoists run on overhead tracking, usually attached to the ceiling, but sometimes on a freestanding gantry. They are electrically powered and can be operated by the hoist user to lift, lower and track sideways. They are used with a divided leg sling that can be put into place whilst seated in a wheelchair. An overhead hoist can be operated by the user without help from a carer. Ceiling tracking can be straight, jointed, curved, and run from room-to-room as required. However structural alterations, such as strengthening the ceiling, or adapting the top of the door frame, may need to be made. Small transfer equipment such as sliding boards and turning discs can be used to help a carer assist with your transfers. However, it is imperative that carers protect their own backs by positioning themselves correctly when assisting with transfers. If your carer has never received any advice on helping a person to transfer, ask to speak to a physiotherapist, occupational therapist or a community nurse. Manual lifting should be avoided, so if the carer finds that he/she is supporting your body weight at any time during transfers, an alternative solution to transferring should be sought. The National Caregivers Library website has some good advice. As does the NHS website. Reach and grip may be improved by using a handling belt. A handling belt is worn by the person being transferred and is basically a belt with handholds. It allows the carer to have a firm grip, without holding your clothing or body. The carer can guide and support your movement. It is not intended for the carer to take your body weight through the belt. These are mobile chairs that can be wheeled by the carer and positioned over the toilet. You can be transferred into the chair in the bedroom directly from your bed where there is more space and scope to transfer. A turner or patient turner, often called an Etac turner after one manufacturer, enables assisted standing transfers. It would only be useful if you are able to pull yourself up to standing and then maintain your own weight. The carer also needs to be relatively fit and able to manoeuvre the equipment. Mobile hoists eliminate the need for lifting. They basically comprise a wheeled chassis, and a boom that is raised to lift you up and lowered to position you on the toilet. In the domestic environment, however, there may be insufficient space to use a hoist for direct toilet transfers. It may be necessary to use the hoist in the bedroom where space is less restricted, and transfer onto a mobile over-toilet chair. Sling hoists have a spreader bar to which slings are attached. For toileting purposes, since it is essential that the user’s bottom is kept clear of the sling, slings with an aperture or a toileting (divided leg) sling should be used. Standing or toileting hoists have a specially designed sling arrangement that enables the user to be lifted in a semi-standing position. To use this style of hoist safely, the person being lifted must place his/her feet on a foot board, be able to partially weight bear through the legs and have reasonable muscle tone around the shoulder girdle as the lifting sling is positioned halfway down the back, under the arms. The advantage of these hoists is that they make it easy to adjust trousers, skirts and underwear. Seat hoists have an aperture seat instead of slings, so the user is transferred in a sitting position. Some may have the option of a commode pan. The hoist lifting mechanism is either operated manually using a winding handle or hydraulic pump, or it is battery powered. Overhead hoists attach to overhead tracking and can be used for independent transfers (see above), but may also be used for assisted transfers if a mobile hoist is not practical. Wherever possible, personal cleansing should be an independent task. Positioning of the toilet roll holder where it can be reached without over-stretching is essential. For people who have the use of one hand only, a dispenser that takes packs of separate leaf paper, or a toilet roll lock to allow sheets to be torn off will help. These are long handled devices to be used with toilet paper, designed to assist people with limited reach. These are moulded plastic bowls that fit over the toilet seat. They have a dish at the front to hold soap and a plug hole or pouring lip at the back to empty the used water into the toilet pan. Add-on bidets are used with an existing toilet bowl. They are electrically powered and provide a jet of warm water to clean and warm air to dry the area afterwards. Please note: permission is required from the local water authority before an add-on-bidet is installed. These replace the existing toilet and combine the features of a standard toilet with that of an automatic bidet, providing a warm water douche and a stream of warm air for drying. It may be necessary to ensure hand washing facilities can be accessed from the toilet to enable people who have difficulty standing to rinse their hands after using the toilet. Someone who is frail or very thin, or who needs to sit on the toilet for a while may need a more comfortable seat to sit on. 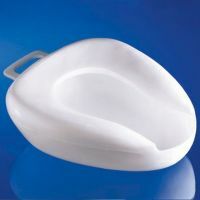 Padded toilet seats that replace the existing seat, either standard height or as a raised toilet seat, are available. 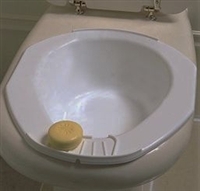 Another option is to use a toilet seat cushion which sticks onto or over the existing toilet seat. These might be air inflated, or made of foam, gel or polyester fibre covered in a wipe-clean material. Similar cushions are available for a commode seat. These cushions are designed primarily for comfort rather than pressure relief. If you are at risk of pressure ulcers, talk to your district nurse about toilet cushions for pressure relief. It is possible to get toilet/commode seats or raised toilet seats with additional shaping. If you have limited hip flexion look for a raised toilet seat with a section that slopes down on your affected area. Many seats and cushions have a cutaway section at the front. Additional pommels at the front are also available to help with positioning or reducing accidental spillage. Someone who has weakness or stiffness in their wrists or hands may find a lever flush difficult to manage. To make flushing the toilet easier, a lever that has a wider, flatter area to accommodate the palm of the hand can be fitted. High level cisterns have a pull chain. Replacing the handle with a large ring will make grasping the handle easier. If a hand operated flush is too difficult to use, alternative controls can be operated by touch sensitive or foot operated switches. Sometimes, it is not possible to access existing facilities. For example, managing stairs might be too difficult or unsafe, or the circulation space may be too tight. If managing stairs is the problem, look at DLF’s factsheet Choosing equipment to get up and down stairs. Circulation space within a room can sometimes be improved by changing an inward opening door to an outward opening one. A portable urinal is a simple way of providing people who have mobility difficulties with a way to empty their bladder. Styles are available for both men and women. Women in particular have to shuffle forwards on their seat so that the head of the urinal can be held close to the body. Clothing styles may influence the ease with which a portable urinal can be used. Men’s trousers with a low opening fly can help when using a bottle; loose fitting knickers such as Cami-knickers that can be pushed to one side may help women. Some urinals are designed specifically for use when travelling and can be sealed, thrown away or contain crystals that absorb urine forming a gel. Some women may find it easier to use a device (such as a She-wee) which allows them to urinate whilst standing or sitting forward in a chair, without removing any clothes, combining this with a urinal for collection. Bedpans are more commonly used by people who are being nursed in bed and who cannot, or should not for medical reasons, be moved out of bed. Bedpans can be fairly easily ordered through local pharmacies. Lifting the buttocks free of the mattress can sometimes be a problem and lifting blocks or an overhead lifting pole can be of help. See DLF factsheet Choosing a bed and bed accessories for further information. The height of wooden commodes tend to be fixed and they may fit in better within the home environment, looking more like a standard chair or disguised as an armchair. The height of metal commodes can be fixed or adjustable; they can be static or mobile and tend to be easier to wipe down. 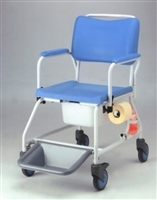 Mobile or wheeled commodes make it easier to position the commode close to the user for transfers. 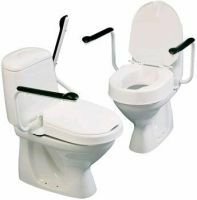 They can also be used as a transfer chair and some can be positioned over the toilet with the commode pan removed. 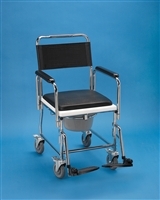 The user and carer must ensure that the brakes are used when transferring on/off a wheeled commode. 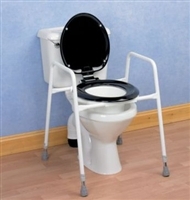 A multi-purpose commode is a simple, lightweight metal frame with a plastic seat and armrests. There is no back support. It can be used as a commode with a plastic pan, as a toilet frame over the toilet to assist with transfers, or as a shower stool. 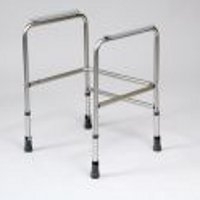 Folding commodes also tend to be more lightweight. 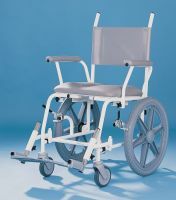 This can be useful for moving and positioning the commode, but may be less suitable for a heavier person who needs the security of a sturdier commode frame for transfers. Seat height and style is important. Ideally, you should sit with your feet flat on the floor so that you are stable. A larger person might be more comfortable sitting on a seat that is square with a central aperture rather than a toilet-style seat. If you are a heavier person, check the manufacturer's details to ensure that the weight limit of the commode is suitable. Some commodes have a padded seat for greater comfort. This may be beneficial to someone who needs to be seated on the commode for a longer time. If sitting balance is poor, a more specialised commode that has a higher backrest and positioning supports may be needed. Some commodes can have armrests that can be removed, dropped down or flipped up to make a sideways transfer possible. 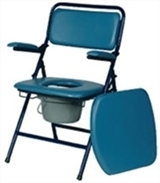 Commodes are used with a plastic commode pan that must be emptied at regular intervals. The commode pan is removed either by lifting it out from the top or by sliding it out from underneath. An overfull pan can be difficult to remove without spillage. If the commode is to be positioned against a wall it would be wise to choose one that does not have a pan that slides out from the back of the seat. If there is nobody to carry out the emptying task, then a chemical commode might provide a solution because it needs emptying less frequently. The commode pan is deeper and contains liquid disinfectant to help neutralise odours and kill bacteria. The larger capacity will mean that the pan is heavier and more difficult to manage. An emptying service may be provided by your local health service. This style of toilet is commonly seen in boats and caravans. They have a reservoir of water to flush the toilet, and a lower chamber containing neutralising chemicals into which the waste is directed when flushed. They may be too low to sit down on if used on their own, but they can be supplied with a frame that includes a platform on which to place the toilet and support rails either side. Their advantage over chemical commodes is that the waste is shut off within the lower compartment. The waste compartment needs to be emptied at regular intervals. Macerating toilets are useful in situations where permanent plumbed-in facilities are required but, due to space restrictions or the distance of the stack pipe, a conventional toilet cannot be installed. These toilets incorporate a macerator that pulps the solid waste to make it small enough to pass through small bore piping that will eventually link up with the main stack. These are toilet cubicles and showering unit combined. They provide both washing and toileting facilities within a relatively small space. The person may sit on the toilet to shower or, space allowing, use an over-toilet chair/sanichair for the two functions. Some units also include a wash basin. Showerloos are useful for people who cannot access the bathroom as the toilet can function using a macerating unit so that the cubicle can be sited virtually anywhere in the home. carry a portable urinal with you for emergencies. Remember drinking is important to maintain fluid balance in the body and to regulate body temperature. It can be dangerous to avoid drinking purely because of anxieties about managing the toilet. You can contact the DLF’s Helpline which is open Tuesday to Thursday from 10am to 4:30pm. Tel: 0300 999 0004 (calls charged at your standard land line rate even if you are phoning from a mobile). Alternatively, you may wish to contact us via email: info@dlf.org.uk. Another source of advice is a disabled or independent living centre where you would have the opportunity to try out a range of equipment. There are several of these around the country where you can go for impartial advice. To find a local centre look online, ask your local authority or contact Living Made Easy. The Bladder and Bowel Community provides information and support services for anyone affected by these conditions as well as their families, carers and healthcare professionals. It also raises aware of bladder and bowel conditions. Bladder and Bowel UK provide advice and support to help manage any kind of incontinence, bladder or bowel related issue. The helpline is for patients, healthcare professionals and anyone who requires further information or support. They aim to raise awareness of continence from a national perspective, whilst supporting patients and professionals to improve the quality of life for sufferers of bladder and bowel problems. The BHTA is the largest trade association for suppliers and manufactures of mobility/homecare products. They have a code of practice to which their members sign up. Contact the BHTA to obtain a list of members in your area. The Centre for Accessible Environments (CAE) is the UK’s leading authority on inclusive design. Their aim is to help secure a built environment that is usable by everyone, including disabled and older people. The website provides a search facility for local changing places facilities. The Changing Places Consortium is a group of organisations working to support the rights of people with profound and multiple learning disabilities to access their community. Changing Places toilets have more space and the right equipment, including a height adjustable changing bench and a hoist. The Changing Places Consortium is campaigning for Changing Places toilets to be installed in big public places. The website provides a number of helplines according to topic. Disability Rights UK is an organisation leading change for disabled people, working to create a society where everyone with lived experience of disability or health conditions can participate equally as full citizens. A charity providing free, independent information and advice on housing and care services for older people across the UK. Foundations is appointed by the Department of Communities and Local Government to oversee a national network of nearly 200 home improvement agencies (HIAs) and handyperson providers across England. Their website has a search facility for local home improvement agencies and handyman services. Planning Portal is the first port of call for anyone wanting to find out about the planning system in England and Wales. It's aim is to provide a one-stop-shop supplying answers, services and information to anyone involved in the planning process – from home owners and businesses to planning professionals and Government officials. Rica is a UK research charity providing information for older and disabled people. They provide some advice on equipment for the bathroom including toilets.